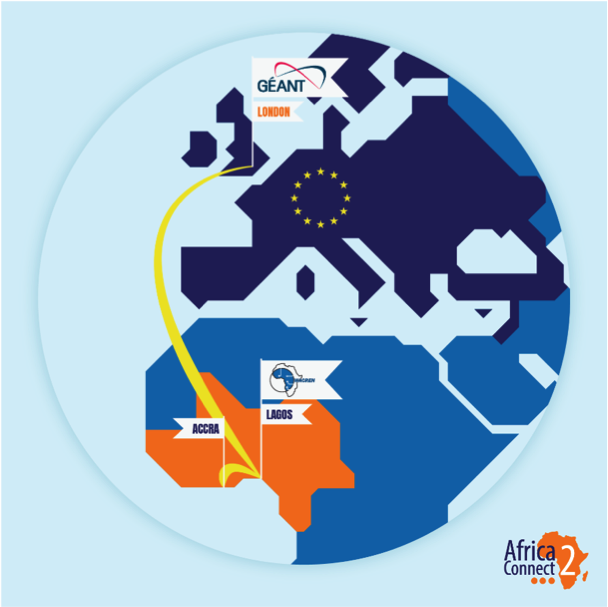 The EU-funded AfricaConnect2 project has just announced that, following the call for tenders to connect West and Central (W&C) Africa published back in June 2016, GÉANT has awarded a 15-year contract to MainOne for connectivity services. By signing the contract through AfricaConnect2, WACREN, the regional Research and Education Network in West and Central Africa, will join the global Research and Education (R&E) networking community. In addition to that, a framework agreement was signed with XON Systems for the provision of network equipment. This comes at the time of an ever-widening digital divide. The slow and sporadic adoption of ICT technologies in W&C Africa has led to one of the lowest internet penetration rates in the world. In this light, the recent contracts announcement will undoubtedly facilitate the digital economy and will allow WACREN to truly unleash its potential and work with its members to meet the needs of its users. Leveraging EU funding, AfricaConnect2 was able to secure a 15-year Indefeasible Rights of Use (IRU) and pay an upfront circuit provisioning cost. This supports the EU objective of creating a sustainable, high-capacity data communications network that serves higher education and research institutions across the region. Initially, the WACREN network will provide a 10Gbps link from Lagos, Nigeria to London, UK where it interconnects with the pan-European GÉANT network, thus providing access to R&E collaborations with over 50 million researchers, academics and students across Europe. As part of the contract, an additional link will go out from Lagos terminating in Accra, Ghana. The implementation of this contract will not only connect the first two countries in West and Central Africa but will also form the building block for the WACREN backbone in support of R&E communities across the entire Central and Western part of the African continent. MainOne is a leading provider of innovative telecom services and network solutions in West Africa. AfricaConnect2 is an EU-funded pan-African connectivity project with a total budget of €26.6m covering a period of 3.5 years. It aims to support the development and consolidation of high-capacity regional internet networks for R&E across Africa and their interconnection with the pan-European GÉANT network, creating a continental gateway for collaborative research and education across and beyond Africa. WACREN is the West and Central African Research and Education Network. The objectives of the organisation are the promotion and establishment of interconnections between national research and education networks in West and Central Africa to form a regional research and education network, the interconnection of this network with other regional and continental networks, and the provision of services aiming at fostering collaboration between research and education institutions in the region, as well as between these institutions and their peers at a continental and international level. To achieve its goals, WACREN works not only with educational and research institutions but also with bodies such as regional economic communities (ECOWAS, ECCAS, UEMOA), telecommunications regulators (WATRA) and a number of national policy and decision-making institutions in West and Central Africa. WACREN was constituted in 2010 and currently includes 11 participating NRENs in the region. MainOne is West Africa’s leading connectivity and data centre solutions provider. We are the first choice for wholesale internet, enterprise services, cloud solutions and managed data services for businesses with global scale ambitions. We operate the only Tier III-certified data centre in West Africa with ISO 27001 and PCI DSS. Our cost-effective and innovative solutions are such that businesses that partner with us are fully empowered to meet the needs of today’s market and also prepared for tomorrow’s growth opportunities. XON Systems Ltd established in 1996, designs, builds, operates, and manages information and communication technology (ICT) solutions created specifically for customers. We are a level 2 B-BBEE business that embraces social responsibility and upliftment.